(Nanowerk News) Uzi Landman, professor of physics at the Georgia Institute of Technology, is the recipient of a Humboldt Research Award for Senior U.S. Scientists. He will accept the award in June 2009 at the annual meeting of the Alexander von Humboldt Foundation, to be held in Berlin. Landman received the Humboldt Award in recognition of his past accomplishments in research and teaching. Humboldt Awards are given to researchers whose fundamental discoveries have had a significant impact on their own discipline and who are expected to continue producing significant achievements in the future. Landman’s award was sponsored by the Technical University of Munich and the Max Planck Institute. Georgia Tech's Uzi Landman is the recipient of a Humboldt Research Award for Senior U.S. Scientists. "I am most grateful to my colleagues who nominated me and supported my candidacy for this prestigious award. It is a happy moment when one's work is acknowledged and recognized by his peers, and I trust that this will encourage us to continue our joint endeavors of research and discovery" said Landman. In addition to the monetary prize, Landman will also have the opportunity to conduct research with colleagues in Germany. He plans to continue his research into nanocatalysis with Ueli Heiz, professor of chemistry at the Technical University of Munich, and to develop joint research projects with Professor Klaus Kern at the Max Planck Institute in Stuttgart on surface-supported nanostructures, quantum dots and self-assembly. Landman is a pioneer of using computer simulations to discover new phenomena on the nanoscale. His main areas of scientific interest are in condensed matter physics, clusters, quantum dots, correlated states and sponataneous symmetry breaking in confined fermionic and bosonic systems, nanowires, nanotribology, nanocatalysis, nanojets, stochastic hydrodynamics, self-assembly, the electronic and transport properties of DNA, and the properties of biomembranes and trans membrane transport, with an emphasis on the development and use of advanced computational methodologies. In 1999 his team, in collaboration with Heiz, discovered that gold is a very effective catalyst when it is aggregated in clusters of eight to two dozen atoms. They also found that electrical charging of gold is crucial to its catalytic capabilities. These theoretical predictions have been verified experimentally, and the research team stands ready to further explore finding ways for control of nanocatalytic activity through the design and modification of the substrates supporting the catalytic clusters, as well as through the use of external fields. Throughout the past decade, Landman and his coworkers have been investigating the properties of electrons confined in quantum dots fabricated at the interfaces of semiconductor heterostructures, and studied as potential logic gates in quantum computers. As early as 1999, Landman, in collaboration with Senior Research Scientist Dr. Constantine Yannouleas, discovered formation of crystalline patterns of the confined electrons, called “electron molecules,” which were experimentally verified in a joint project with a group at the ETH in Switzerland and published in 2006. This research has been extended recently to investigations addressing formation of “boson molecules” in ultra-cold trapped atomic systems. Landman said that he is looking forward to develop joint research projects on these topics with German, and other, colleagues. Landman joined the School of Physics at the Georgia Institute of Technology in 1977. He is currently a Regents' and Institute Professor, holding the Callaway Endowed Chair in Computational Materials Science, and serving as the director of the Georgia Tech Center for Computational Materials Science. 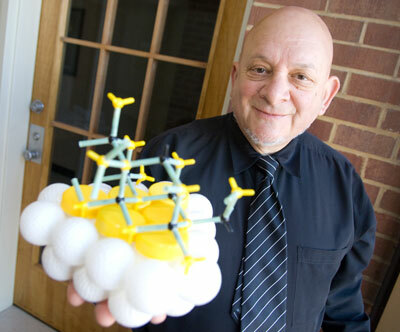 Landman has published over 350 articles and co-authored a book titled "Nanocatalysis." He is an elected fellow of the American Physical Society and the British Institute of Physics, and he received several honors and awards, with the most recent ones being an invited lecture at the 2000 Nobel symposium on clusters, the 2000 Feynman Prize in Nanothechnology, the 2002 American Material Research Society (MRS) medal for his pioneering molecular dynamics simulations which led to elucidation of the microscopic mechanisms of tribological processes, and the 2005 American Physical Society Rahman Prize in computational physics. He received the Georgia Tech distinguished professor award in 1992.